Doug and Sharon Twiddy’s first restoration project began in 1986 when they purchased the Kill Devil Hills Lifesaving Station. Doug Twiddy had long admired the handsome structure and, feeling compelled to preserve this piece of Outer Banks history, would ask its owner every Labor Day if he would consider selling. Utilizing the station as employee housing at the time, the owner’s response was always no. Eventually, the owner agreed to sell the station. On the condition that it would be removed from its oceanfront location, Mr. Twiddy was at long last the proud owner of the station. Built in 1878, the station was in disrepair and was wedged between a complex of motels in Kill Devil Hills. That fall it was moved to its current location in Historic Corolla Village where it was slowly and painstakingly restored. One of eleven stations erected along the Outer Banks at the turn of the century, Lifesaving Station # 13 was located on the oceanfront in Kill Devil Hills to the east of what is now the Wright Brothers Memorial. Relying on the bravery of local volunteers, the Lifesaving Service responded to the frequent shipwrecks off the coast. In addition to the station’s countless lifesaving accomplishments, it also has a close association with man’s first flight. Situated approximately ½ to ¾ of a mile from the Wright brothers’ camp (which they set up in September of 1903), the station’s crewmen became interested in the work of these brothers who intended to launch their flying machine off the side of big “Kill Devil Hill.” Surfman Adam D. Etheridge visited the brothers at their campsite, establishing a friendship that would lead to the crewmen’s chance to witness history. Keeper-in-charge Captain Jesse Etheridge Ward granted his crew permission to assist the brothers when they were not on duty. The men also delivered food and supplies to the brothers. As winter fell, the station crew members became more than just helpful, they were practically indispensable. The Wrights began hanging a red flag outside of their workshop to notify any off-duty surfmen willing to lend a hand that they needed assistance. Helping to assemble the aircraft and carry it to the launching rail became their usual contribution. For all intents and purposes, these men were the first aircraft ground crew. Surfmen William Beacham, Robert Wescott, Benny O’Neal, W.S. Dough and John T. Daniels helped Orville and Wilbur move their flying machine to the top of Kill Devil Hill on December 14th and witnessed Wilbur’s unsuccessful attempt at flying that day. Daniels, Dough, Adam D. Etheridge, W.C. Brinkley of Manteo and Johnny Moore of Nags Head were once again beckoned to help move the fragile craft up the hill on the bitterly cold morning of December 17, 1903. At 10:35 AM, the flyer teetered down a wooden rail and twenty-three to twenty-seven mile-per-hour winds lifted the craft to flight. The Wright brothers’ first successful flight was witnessed. 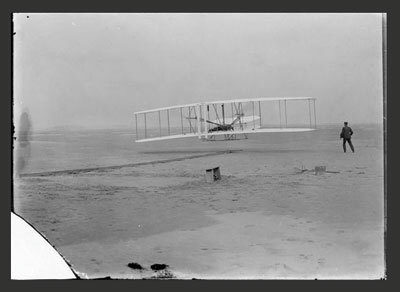 Daniels, using Orville’s camera, snapped the well-known photograph which documented this historic flight. It was later awarded the title, “The Photograph of the 20th Century.” Daniels, Dough and Etheridge all signed the official affidavit verifying that the first flight was, indeed, a true story. 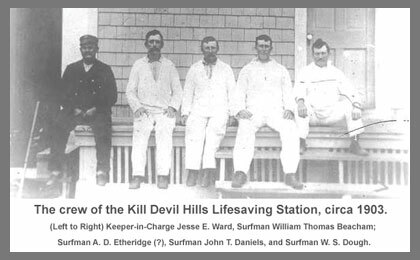 The Kill Devil Hills Life Saving Station was active until 1933. 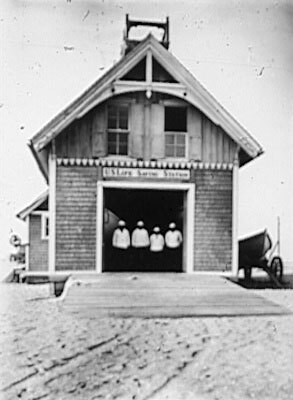 After purchasing the station, the Twiddys arranged have it moved to Historic Corolla Village, where restorations would take place and it would then be used as an office. Obviously, moving a 100-plus-year-old building over 20 miles was no small feat. The building was first divided into three pieces: the first story, second story and southside wing. Then, up the bypass and Duck Road it went, one piece-at-a-time. Once settled and pieced back together, restoration work began. As modern paint was chipped away and 20th century carpet peeled back, the building began to reveal its original bones, silently guiding the restorative process. Pieces of the station’s past life began to surface during the restoration. The original “U.S. Life Saving Station” sign was found as the building was prepared for the move. It was later displayed inside, and a carefully created replica was hung in its original position on the outside of the building. A 13-foot oar stamped with the letters "USSLSS" was also found under the building during the move. Other historic artifacts were found in the eaves of the roof. They included an 1887 Annual Report of the Operation of the US Lifesaving Stations, an 1890s copy of Cosmopolitan magazine, a 1905 Sailor’s Magazine, several old bottles and the original hand written document on the wreck of the sailing vessel Josephine. The attic stored a telegraph machine and a seashell cupping the station’s original red primer paint was also discovered. A collection of relics found during restoration as well as Lifesaving Service and Wright Brothers mementoes are currently displayed in the station. The cedar-shake building combines elements of Carpenter Gothic and Eastlake style. The side shed extension where lifesaving gear was stowed was added in the early 1900s. The front-gable, one-and-a-half story building still wears its original exterior singles. Unpainted tongue-and-groove pine walls and ceilings and basic door and window surroundings with bull’s eye corner blocks represent the interior exactly as it was in its earlier days. Upon completion of the restoration, Twiddy & Company utilized the building as an office. It would later house a retail shop and now again serves as Twiddy & Company’s Corolla real estate sales office. This would be the first of many preservation efforts by the Twiddys.